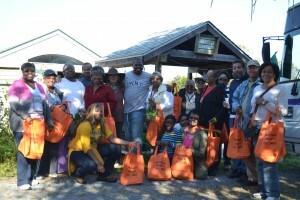 A day of harvesting and cooking at White Rose Farm, Md. Trying to promote substantive change in the growing and eating of food is a challenge to anyone. Without partners, even the most gifted, eco-friendly farmer grows the finest of foods using the finest of methods only to see the food rot because there is no one to help move and consume it. Likewise, the Baltimore Food and Faith Project (BFFP) needs partners to help us fulfill our mission and to walk alongside us exploring new ideas, holding discussions, and trying new initiatives. In the summer of 2014, Sally Voris of White Rose Farm in Taneytown, Maryland, offered to partner with the BFFP to host congregations interested in spending a day on the farm to explore the crops, harvest food, prepare and cook food, and then enjoy the fruits of their labor through a meal. The idea was to introduce people who would have previously been unaware of, or perhaps even hostile toward, the process of farming in a way that was fun and “tasteful” (pun intended). While the idea seemed fantastic, finding a congregation with people who were both unfamiliar with farming and willing to try their hand at farming was a challenge. Barbara Bates-Hopkins, Sally Voris, and Darriel Harris, 2014. While another BFFP partner, Barbara Bates-Hopkins of the JHU Center in Urban Environmental Health, and I were planning to collaborate on her Day at the Market campaign and a Bring Your Bible to Brunch event, I mentioned the proposal from White Rose Farm. Barbara told me that her church, Mt. Zoar AME, and a few others would be interested. As we planned and discussed the trip to the farm, the enthusiasm grew in some areas and waned in others. 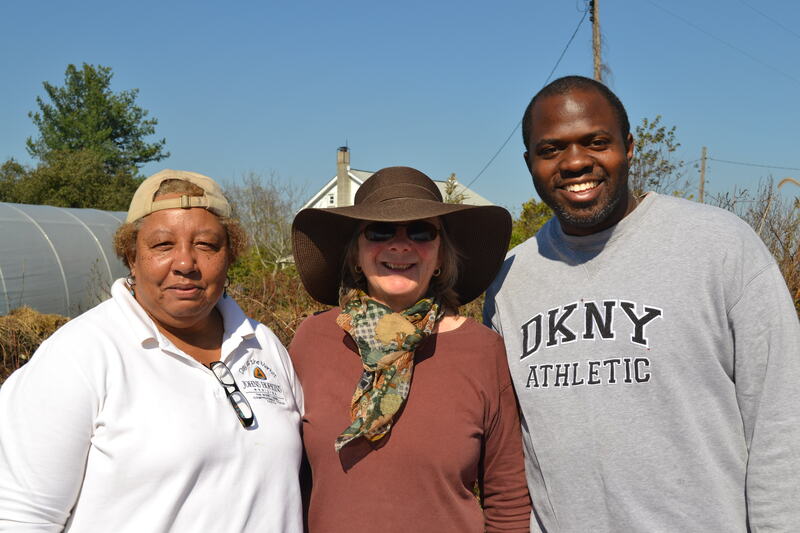 In the end, Mt Zoar AME and four other congregations in the Baltimore region came together for a trip to Taneytown to visit Sally Voris’s White Rose Farm. Once at the farm, the partnership of focus was the people from the congregations to the farm itself. Sally informed the group that one of major problems with the way we conventionally farm and eat is that the ground produces food, then we consume the food, and the scraps that should return to the ground to provide nourishment to the soil never make their way back to fields. Thus a natural cyclical process of growing has become linear. The congregants pondered this lesson while they harvested turnips, beats, salad greens, and broccoli. Others picked apples and pears and immediately began making apple (and pear) sauce. Another group cut potatoes and herbs into a mixture to be placed over an open fire. After a few hours, we had a meal consisting of the food we picked and prepped, accented by meat from a local butcher, breads, homemade teas, and water. As we ate, another partnership that began during the harvesting and prepping of our meal was cemented. That is, the partnership formed between the members of the five participating congregations, Barbara, Sally, and me. We talked, laughed, and enjoyed our self-harvested feast. Sally shared her story of how she came to start the farm. Kim Francis of Kim Ease ministries told of her plans to start a farm in a spacious lot near her home. Others shared of their hopes to begin congregational gardens, and how they once farmed as children in their respective homes. The time of sharing over our meal was perhaps the highlight of the day. There is something special about the breaking of bread. People shared very personal stories; stories that included details of their parents, children, spouses, past experiences, and future hopes. The past experiences included their interactions with important people in their lives, and the future hopes included the footprint and expectation of the partnerships they experienced and began one October day at White Rose Farm. And thus the seeds of change were planted as they normally are, through meaningful encounters with people willing to share their gifts, passions, and the fruits of their labor. Images by Adante Hart, 2014. This is great! So glad to see these kind of food and faith collaborations. Keep up the great work!